Why Are Some Older Homes In Eagle Mountain Still On Copper Instead Of Fiber? Home >> Customer Service >> Why Are Some Older Homes In Eagle Mountain Still On Copper Instead Of Fiber? Why are some homes in Eagle Mountain still on copper, while most are being served with fiber to the home? What is preventing Direct Communications from taking fiber to every home today? The very short answer is simply: money, and the sheer cost of the citywide upgrade. The slightly more expanded answer is specifically: cash flow. The more complex answer, that requires some real explanation, is government regulation of our industry, and how the business model of rural telecom works. Firstly, let’s be clear—we wish we already had fiber to every home in Eagle Mountain. If we could wave a magic wand, we would make that happen today. Our research and data shows that fiber customers are more satisfied with their service, irrespective of the bandwidth package to which they are subscribing. Further, our data indicates that fiber customers cost less in maintenance and customer support. Our goal is to upgrade every home to fiber as quickly as possible because it is better for our customers, the community, and us. If you are still on the copper network, waiting for our fiber optics to come to your house, please know that we are working as fast as our available funding and resources allow to get the whole city upgraded to fiber. Rest assured that while you wait for fiber, our copper network is still absolutely your best and most reliable connection option. We use 4th generation ‘VDSL’ technology to hit the fastest possible speeds over our copper network. Plus, only Direct Communications provides you with your own dedicated line to your home, and true unlimited bandwidth with no data caps, or throttling. The good news is we have secured outside financing for the new year, with the aim to bring in external construction contractors, to try to speed up the process of upgrading old copper neighborhoods in the Ranches to all new fiber. Starting in April 2015, we will begin upgrading the neighborhoods around Nolan Park, which we refer to as the Chimney Rock area in our network map. These subdivisions were chosen specifically because the original copper lines put in by the property developers were in dire need of upgrade or replacement, but we will use various criteria when selecting which subdivisions to upgrade next, depending on the whole network needs and best long-term engineering solutions. If you are thinking of moving to Eagle Mountain, and want the absolutely fastest possible internet speeds, check to make sure the home is already connected with Fiber to the Home. 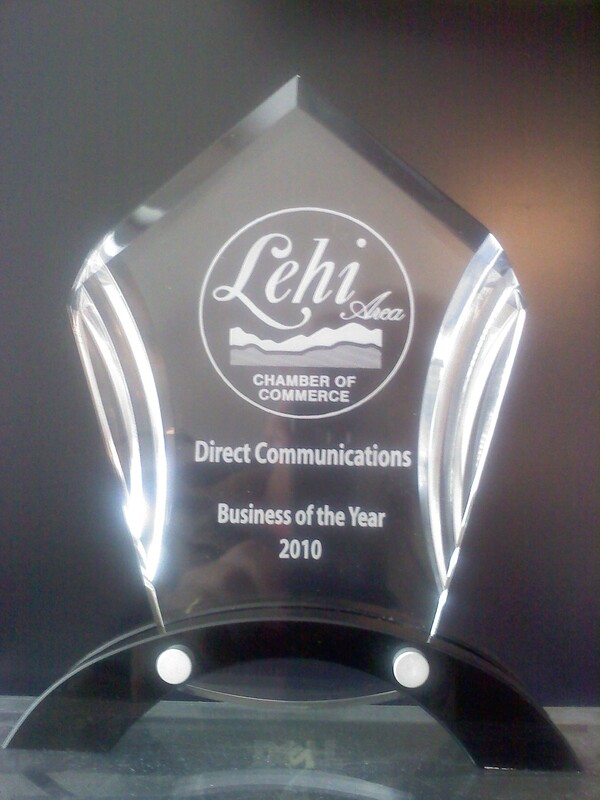 Call Direct Communications at 801 789 2800 and ask if the address is served by fiber. For a Google Earth map of which neighborhoods are currently served by fiber, download this KMZ file of our network and open it in Google Earth. If you don’t have Google Earth installed, download it for free at http://www.google.com/earth/download/ge/agree.html or download the app for your smartphone or tablet. When Directcom purchased the previously city-owned network from Eagle Mountain City in 2006, the number of houses with fiber to the home was 0 (zero). The number of homes in Eagle Mountain with fiber to the home is now several thousand. So, we have made progress, but yes, there are still neighborhoods we need to convert from DSL to Fiber. The company has already upgraded about half of the older subdivisions from copper to fiber; however, due to simple budget constraints, we cannot run it to everyone at once. Over the past few years, Directcom has been able to upgrade about 300 older homes a year to fiber, while at the same time kept up with fiber construction to all new subdivisions. During 2013 the company upgraded Cedar Trails, Sage Valley, and the Eagle Landing subdivisions from Copper to Fiber lines. During 2014 we upgraded Pioneer and Mountain View. By the end of 1st quarter 2015, we will be completely done with the city center upgrade, and then we will begin to upgrade the older subdivisions in the Ranches systematically. Since 2006, we have invested about $24 million into network assets. (This is public information that can be can be sought from the State Tax Commission.) This should give some perspective into the cost of building a modern fiber network. Where does all that money come from? Not from your internet bill, but keep reading, and we will answer that later. 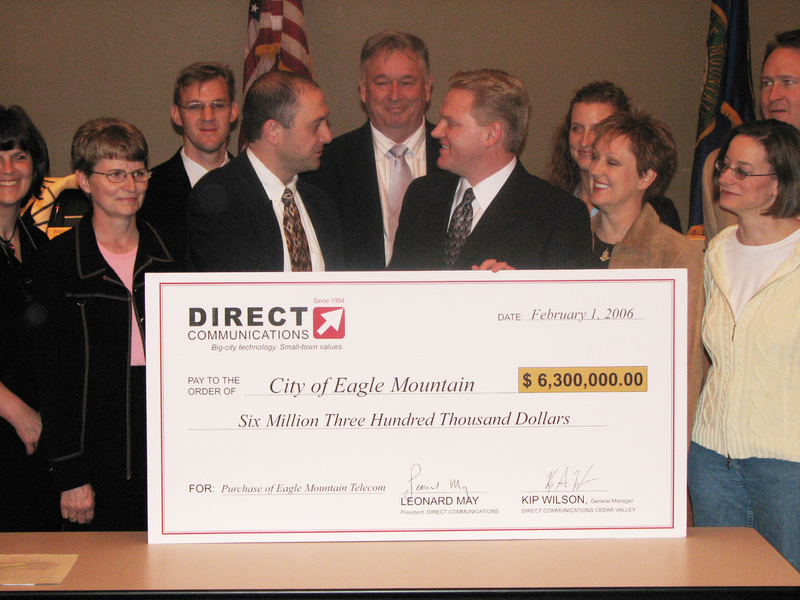 Direct Communications purchases the Eagle Mountain City Telecom network for $6.3 Million in 2006. Some background: Direct Communications bought the former Eagle Mountain Telecom in 2006, after the city had tried for many years to sell off its telephone network. The cost of building and maintaining a telephone network was driving the city slowly towards bankruptcy, and Direct Communications, a private telecom provider with a business model that works for remote areas, stepped up and offered a solution for residents of Eagle Mountain, and Directcom paid off the Municipal Bonds which had financed the City’s network. Direct Communications originally bought the network from the City for $6.3 million, and every year since then we have invested significant resources into upgrading the network plant to fiber optic lines, and upgrading switches, electronics and equipment to power the fiber. So, what is preventing us from upgrading all the homes to fiber in the same year? Like all businesses, we work within certain constraints. Our available budget is one constraint. Acquiring capital is a major constraint. For us, and most small businesses, managing cash flow is a major constraint. A small company can easily go bankrupt by growing too fast and not having the cash flow to keep up with growth, because of the time lag between investment and recovery on that investment. That lag needs to be financed. Most fast-growing startups must be fueled by outside investment capital, especially those with high construction costs like communications networks. Without this, they would not have the cash flow to even pay their employees because of this time lag. Directcom, essentially still a startup, must finance most of its network growth and upgrades through borrowing from banks and government entities devoted to lending to rural institutions. Borrowing the millions of dollars needed for upgrades is not easy, and very tight government regulation of our industry makes it especially challenging to acquire financing. Put simply, we just can’t get our hands on the huge amount of money needed to do all the upgrades at once. An important piece of this puzzle is to understand that end consumers themselves could never pay for the real cost of bringing fiber to their homes under pure market forces in a community this size. Clear evidence to demonstrate this claim is that there no other wireline provider in Eagle Mountain. However, rest assured, Eagle Mountain citizens, that we are truly the only provider who really loves you, because we are here with you and working diligently to bring fiber optic connectivity to every home and business. This is our only market, and Direct Communications Cedar Valley has no interest outside of Eagle Mountain. You are our only customers. We should mention the need to build and scale the network in a technologically sound way. Switching everyone all at once would drastically impact our network, resulting in months or years of chaos and a bad consumer experience for everyone in Eagle Mountain until we stabilized everything again. We want to build it well, not just for today but for decades to come. That along with identifying trouble/aged areas in the network is the primary determinant in where to upgrade and how to improve the network. The upgrades have to be carried out in a manageable fashion that will fit within capabilities, and our financing model. Direct Communications makes their investment in fiber construction back over several decades. We borrow to build the network, and then during those decades of cost recovery, an FCC program pays a specified rate of return, which provides the incentive to invest in remote areas, and allows us to pay back the debt. Without this program, Eagle Mountain would not have a fiber network at all, and we would not have a viable business model. (Also worth noting is that there is a several year gap between when we put fiber into the ground and when it is allowed to start being recovered on under the FCC program.) Of course, along with this federal cost recovery program, comes federal regulation—a lot of it. In spite of the very real and genuine challenges resulting from cash constraints, burdensome government regulations, and ever increasing network demands, we are excited about the accelerated deployment of fiber to the homes that we’re pursuing in order to continue providing premier internet experiences for our customers now, and to prepare for the way people will use the internet in the future. It is often trendy to trash government regulation and by no means are we fans of a great deal of it, but in rural communities where there is no viable business model for the deployment of fiber networks the model of a regulated monopoly makes the most economic and social sense. It ensures a provider of a business model that incents investment and then a statewide regulatory authority regulates the monopoly to protect the consumers who have no other choice where to go for wireline services. So, we will continue to slowly but steadily upgrade from copper to fiber as the business model allows. If you are already on fiber, know that you are enjoying the most advanced broadband technology available anywhere in the world. If you are one of the customers still on copper, try to console yourself with the fact that you do have fiber to your neighborhood or street node. Only the last few feet through your yard to your home are actually still copper lines. We currently deploy the latest VDSL equipment to maximize the copper technology, and you can choose 20Mb DSL speeds, which is enough to stream about 3 Netflix movies at the same time. We are currently looking at increasing that copper offering to a 30Mb download to tide you over until we get fiber to your home. Someday every home in Eagle Mountain will have fiber all the way to the home, and the happiest people of all will probably be the employees of Direct Communications, your local broadband provider.